Ncell has brought a new offer called recharge and win offer. 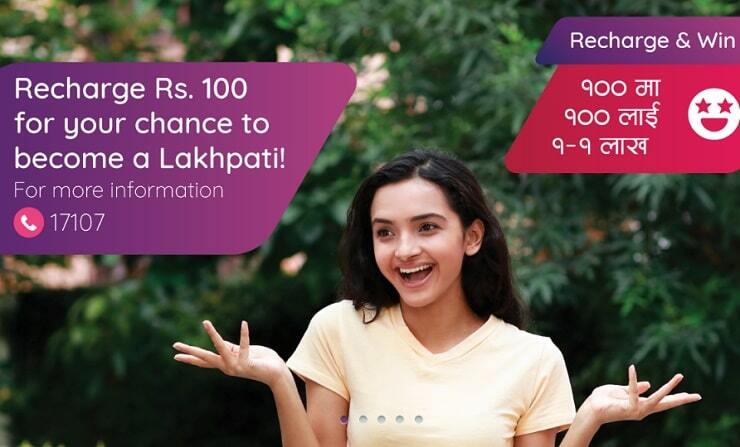 With Ncell recharge and win offer, customers can win 1 lakh for recharge of Rs 100 and more in a week. The offer will run for 10 weeks, and each week there are 10 winners. For recharge of each Rs 100 in Ncell in a week, a customer will get 1 code number per Rs 100. The campaign starts from Sunday to Saturday. After each week, customers get the code on their mobile by Monday for every Rs 100 recharge. dial *17107# and they will tell the total recharge in a week. If a customer recharges Rs 450 in a week, then the customer will get 4 code number in their mobile through SMS. That means more the recharge, more the chance of winning. For more information about Ncell recharge and Win offer, people can dial 17107 to know more. For the offer, recharge from any means like recharge card, online top-up, cash payment via Ncell center, VFT is valid. But Ncell Sapati and balance transfer will not be eligible for the offer. All the code generated from all customers in a week will go to the lucky draw. The winners will be selected every Tuesday on a live show at 7 pm on AP1 TV. For each week, 10 winners will get Rs 1 lakh each. Ncell recharge and win offer is applicable till November 10, 2018, which is after 10 weeks. The winner should have the SIM card to be registered in their own name to claim the prize. Ncell customers can easily transfer the SIM owner by going to the Ncell centers. Ncell latest data packs: List of all data packs in Ncell.